As part of their sixth annual Yes We Can! 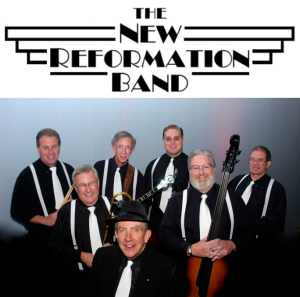 program, Creative 360 will host a concert by the New Reformation Band (NRB) on Friday, February 15 at 7:00 p.m. Guests will enjoy an evening of spirit-lifting music that encompasses Dixieland, ragtime, blues, big band, and swing for a fun-loving, knee-slapping, toe-tapping experience. Admission is $15 prepaid, $18 at the door. Bring your own beverage. Call Creative 360 at 989-837-1885 for tickets or get them online at becreative360.org. NRB will celebrate their 49th birthday on February 8. They’ve played together since a 1970 “one-time performance” at a Saginaw church. Today, they are recognized as one of the country’s pre-eminent classic jazz groups and have played their joyful sound in thousands of performances from coast to coast, Hawaii, Canada, Europe, the Caribbean, and South America. To date, NRB has produced 16 albums. Many will be available for purchase. Find more information about them on their website at https://newref.com. Six years ago, Creative 360 developed an innovative program designed to recognize and honor the contributions of people who are 80 and over in a way that respects their knowledge and taps into their legacy of creativity. This amazing segment of our population has a wealth of experience and knowledge to share. The Yes We Can! program gives people of all ages ongoing opportunities to engage with, and learn from, this dynamic group of senior presenters. Since the program began in the winter of 2014, Creative 360 has celebrated more than 300 Great Lakes Bay artists, scholars, scientists, and community leaders. These octogenarians inspire everyone to be more active and to realize we can all be contributing community members at any age! Thanks to The Barstow Foundation, NADA Northwood University, and Space Studios for their generous sponsorship of this year’s Yes We Can! program. For more information about Yes We Can!, go to Creative 360’s website at becreative360.org or call 989-837-1885. If you know of someone who is (or soon will be) 80 or above and should be considered as part of future Yes We Can! programs, please contact Creative 360 at 989-837-1885 or by email at creed@becreative360.org.